There are plenty of low-calorie drinks on the market: light beer, pre-bottled drinks from everyone's favorite Real Housewife, and even spiked seltzer. But while these are light on calories, they're also often light on flavor. This is why you should turn to wine. While a 5oz glass of wine can top out at around 270 calories, there are plenty that fall around the 100-calorie mark. Best part is, they aren't "diet" versions of the good stuff. Plus, unlike those other drinks, wine is filled with healthy antioxidants, so drinking a glass of wine is practically like drinking a kale smoothie, right? Calories in wine come mostly from its alcohol content and the process by which it's made. That last part is also known as vinification, a fancy term that is good to drop at dinner parties if you want to sound like a person who gets to spend their time summering in the French Riviera. Basically, during fermentation, the sugar in grapes turns into alcohol, and the more alcohol the wine has, the higher the calorie count. So sticking with wines made from low-sugar grapes is the move if you want to have your vino and your waistline, too. We've included an average calorie range per 5oz glass below, but as with everything there are some other variables -- like the producer and the growing conditions -- that can change that number. 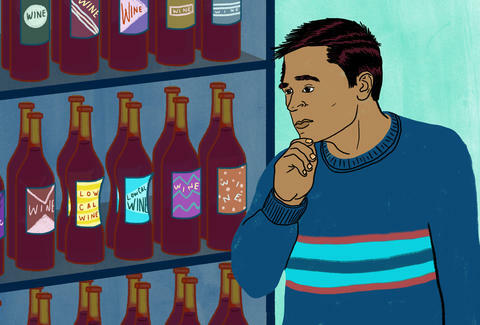 Below, the best wine styles to drink when you're looking for something lighter. You shouldn't stop popping bottles just because you are on a diet. Champagne is a great low-calorie option. Just make sure to read the label carefully: Sugar is often added to Champagne to make it extra palatable. Avoid labels with the words doux, sec, and extra sec (which all indicate how sweet a Champagne is), and instead look for a label that says extra brut, which translates directly to "hot bod." OK, not quite. But it does mean the bottle has basically no added sugar. Just go easy on the mimosas. This is a light-bodied, dry white wine from a cool climate. This is a good thing. Grapes from warmer climates tend to ripen at a faster rate, and the riper the grape, the more sugar it has. This wine is best when you are craving a glass of California chardonnay. It may not be as big or buttery in flavor, but it has 50 to 100 fewer calories per bottle. Rieslings have a reputation for being super-sweet, but that's not always the case. Some rieslings, like a kabinett or spatlese from Germany or Austria, tend to actually be quite dry or low in sugar. This is because they are made with grapes that are harvested earlier in the season and therefore less sweet. You're looking at roughly a 120-calorie disparity -- basically half of a Snickers bar -- between a bottle of dry riesling and a sweeter riesling like an auslese, which uses a grapes harvested later in the season. Sauvignon blancs are low on the calorie totem pole, but big in aroma and flavor -- the ideal combo when it comes to wine. While this grape is grown all over the world, pick up a bottle from New Zealand. The cool climate Down Under means that the grapes used are lower in sugar and the wine is more waistline-friendly. Unfortunately, drinking a bottle won't give you a charming accent -- you'll have to actually spend time in New Zealand for that. If there is one wine worth stocking up on from this list, it's definitely gamay. This red is super-easy to drink because it's fruit-forward and light on the palate. It's low in alcohol content (fewer calories), and it's usually pretty easy on your wallet too (the one thing you definitely don't want getting super trim). Plus, the wine is delicate enough to drink with your grilled chicken breast and steamed veggies. Drink enough of it and you might be able to convince yourself that you really do love grilled chicken breast instead of hamburgers. Forget everything Paul Giamatti ever said in Sideways -- merlot is a great, bold wine that is very easy to drink. Look for bottles with the words "right bank" (this indicates where in France the wine is made) on the label. They will have about 100 fewer calories in a bottle than a similar wine, like a cabernet sauvignon from Napa, because the French tend to make wines that are lower in alcohol. Crack open a bottle and you'll be in good company: Former President Thomas Jefferson loved drinking this red wine, and he was a pretty noble dude. 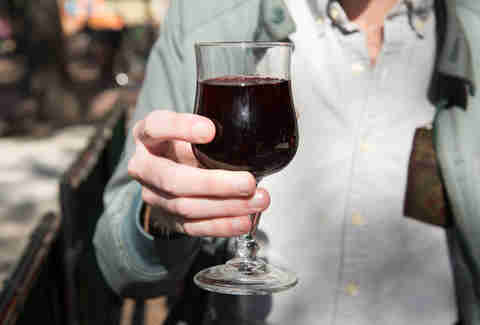 Pinots from Europe, or the Old World, have a lower alcohol content than pinots made in other parts of the world. This is because the majority of pinot-growing regions in America tend to be warmer than the climates in Burgundy, France. So stick to bottles of pinot noir from France. If you get one from the Pacific Northwest, sure, it'll be delicious, but it will also have about 20 more calories per glass. The choice is yours. Lisa Elbert is an associate staff writer for Thrillist whose math skills aren't strong enough to count calories. That's why she’s a writer. Follow her on Twitter and Instagram.